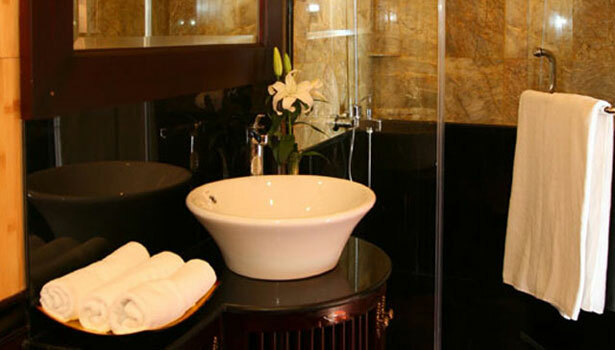 Officially open on 18 December 2007, our newest four star junk – Jasmine Junk Cruise Halong Bay Vietnam – set the standard for services and amenities on the bay. 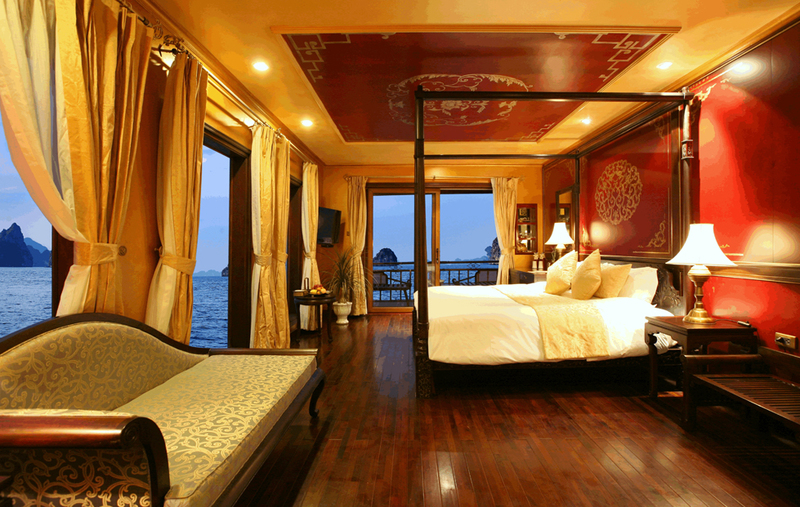 Fitted out in the 1930′s Indochine style, the Halong Jasmine features 22 spacious cabins, restaurant, lounge and two special Jasmine Suites with their own jacuzzi & balcony for uninterrupted views of the bay. 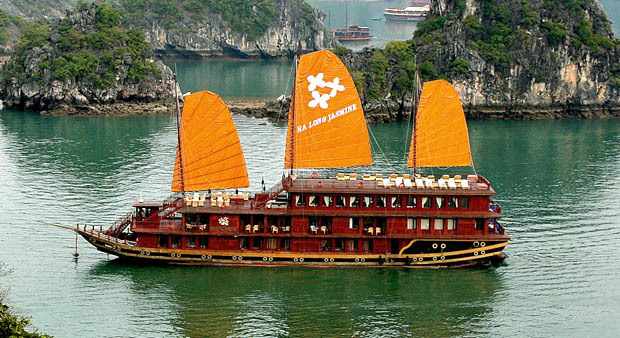 Enjoy the intimacy of a small party within the space of Halong Bay’s largest cruise junk. A lengthy 55 meters from bow to stern and measuring an impressive 11 meters wide, Halong Jasmine can accommodate 80 passengers at any o­ne time across four luxurious decks, with an overnight capacity of 48. 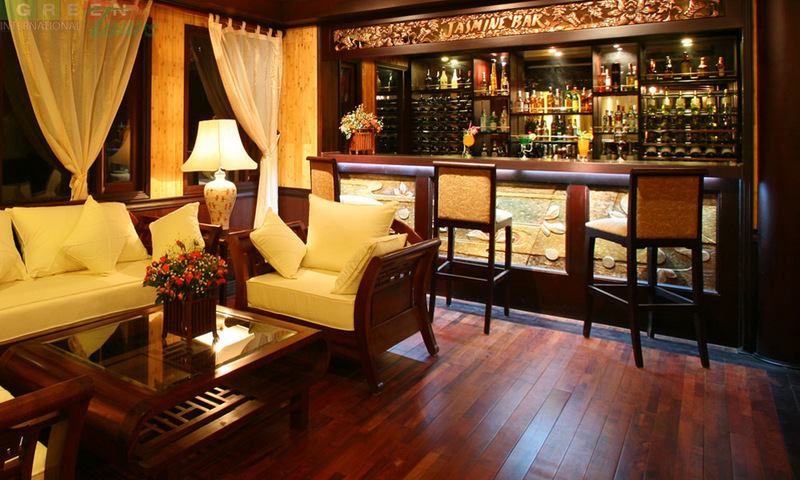 The attention to detail and quality of design is apparent in every inch of thisluxury cruise, artfully marrying space, rich 1930s Indochina-style wooden décor and exquisite ornamentation throughout its air-conditioned bedrooms, restaurant, bars and communal spaces. Children under 5 years old are FOC, sharing a room with parent/s. Children from 5 to 7 years of age are charged 50%, sharing a room with parent/s. 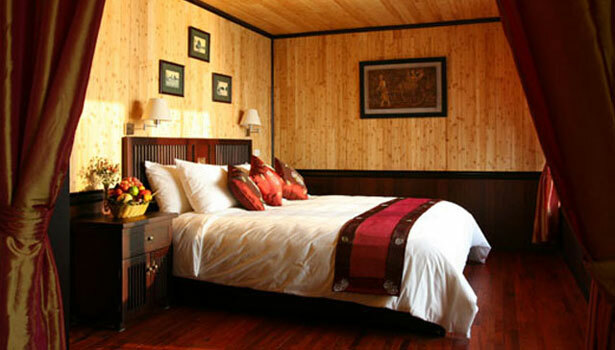 – Those on a luxury Vietnam holiday and wish to experience Halong Bay in style. A delectable buffet lunch is served shortly upon boarding and you find yourself getting acquainted with the facilities of the boat. The boat starts to cruise into the Bay and within the first hour you can enjoy this World Heritage Site. A first visit will take our guests by tender to the Tien Ong Cave. The Cave is huge – about 2.000 sqm – and is peppered with beautiful stalactites and stalagmites, formed out of ancient limestone karsts about 700,000 years ago. The cave is four meters above sea level. This visit will last approximately 20 minutes (we strongly recommend that you do not wear high heel shoes for this excursion). 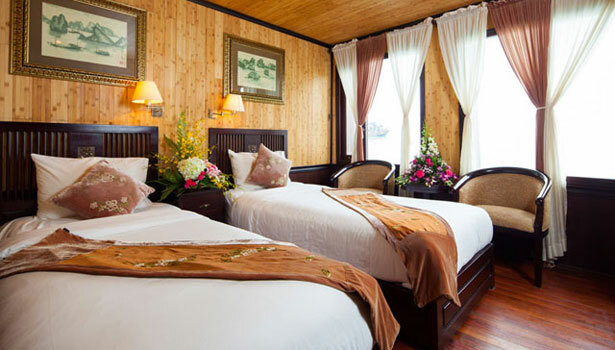 The voyage continues with the arrival at the Cua Van Fishing Village, the biggest and oldest fishing village in Halong Bay via a pleasant boat ride (a maximum of four persons per boat). You will pass by this ancient village which comprises floating houses and floating schools – simply irresistible. After returning to the boat in the late afternoon guests can sharpen their culinary skills at our cooking class performance conducted by our energetic chef. Surely you can give him a helping hand any time and try your skills in preparing special Vietnamese dishes. The boat cruises slowly with the evening sun to its mooring points. If not now when then it is time to enjoy a massage or at least to quaff a drink – in the miraculous descending sun – on our terrace deck. 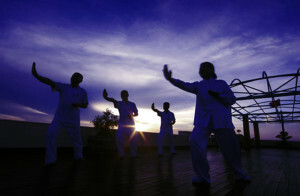 At approximately 19.00h guests can attend a presentation in the restaurant area about the Halong Bay before dinner is served. The night is yours – kick back on a comfy pillowed bench and inhale the surreal beauty whilst sipping a glass of wine. Not many places in the world offer those special feelings. The mooring place is a fantastic overnight spot with glittering lights from the other boats and a calm sea, perfect for your first dream in the middle of the Bay where once Dragons played amid sparkling jewels. A first visit will take our guests by tender to the Tien Ong Cave. The Cave is huge – about 2.000 sqm –and is peppered with beautiful stalactites and stalagmites, formed out of ancient limestone karsts about 700,000 years ago. The cave is four meters above sea level. This visit will last approximately 20 minutes (we strongly recommend that you do not wear high heel shoes for this excursion). After this, guests cycle back to the dock and board the junk. The cruise continues unhurried to Ho Ba Ham. During this slow trundle, lunch is served. At this secluded area guests kayak through water tunnels and close to stunning rock and islets. This beautiful lagoon allows as well to jump from the boat or at a quiet beach for a refreshing bath. Back on board take your seat or bench on the sun deck and simply dive into the nature on the way back to your mother junk for your second night. In the morning, the Sunset crew welcomes all guests from Ginger, Jasmine and Violet. A breakfast is served in the cozy restaurant while the Sunset moves deeper into the Halong Bay straight to Cat Ba Island. Even the weather might not be that suitable but still the Bay offers mysterious views and photo objects from the sun deck. 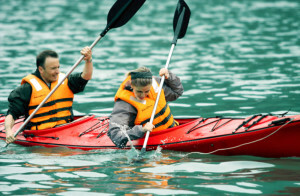 Kayak and swim at the Hai Quan lagoon area and get in close touch with the Bay. Before midday, we cruise to the “Surprise Cave”. Lunch will be served in the restaurant of the Sunset. After lunch, guests visit the “Surprise Cave” or they can engage in kayaking around the Luon cave tunnel. 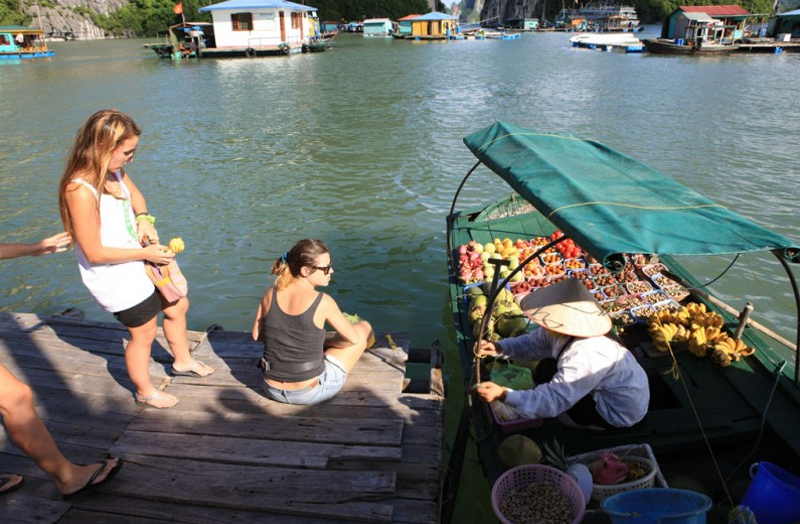 In the afternoon, the Sunset cruises back via several Halong Bay sights – Cua Van fishing village – Soi Sim – Dau Xuoi channel and Toad Islet – before boarding the mother junk again for the overnight. 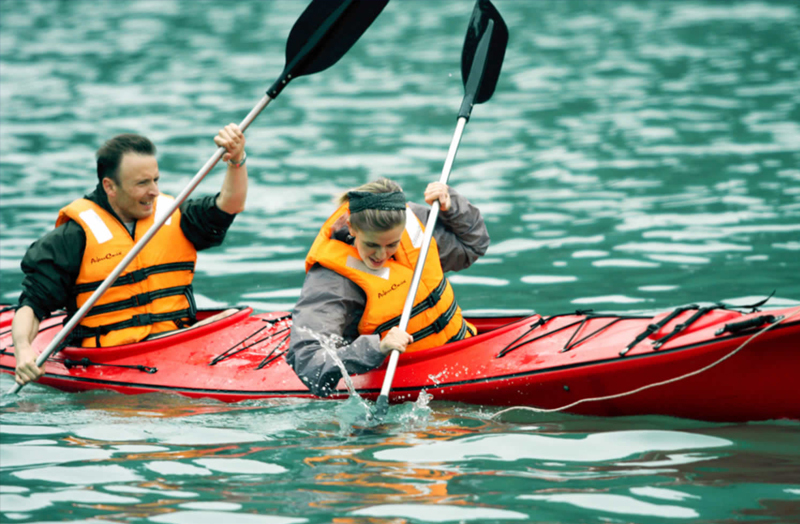 Biking helmet, First aid kit, durable shoes, water bottle during cycling, torch for cave visit, rain coats (in case of light showers, in the event of heavy rain, biking will be cancelled), kayaks/paddles and life jackets. 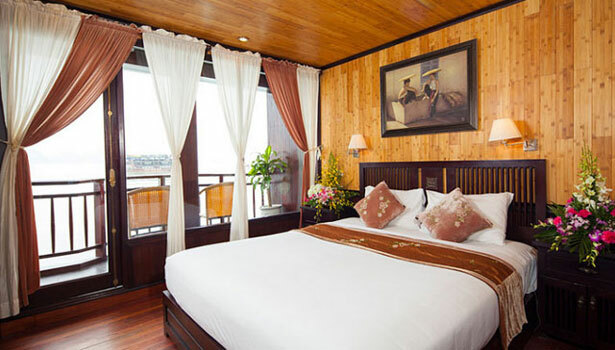 For guests who do not want to go cycling to Viet Hai: Enjoy a relaxing spa treatment on board or walk along the water front, fish at the dock or take a cooking lesson from the chef.